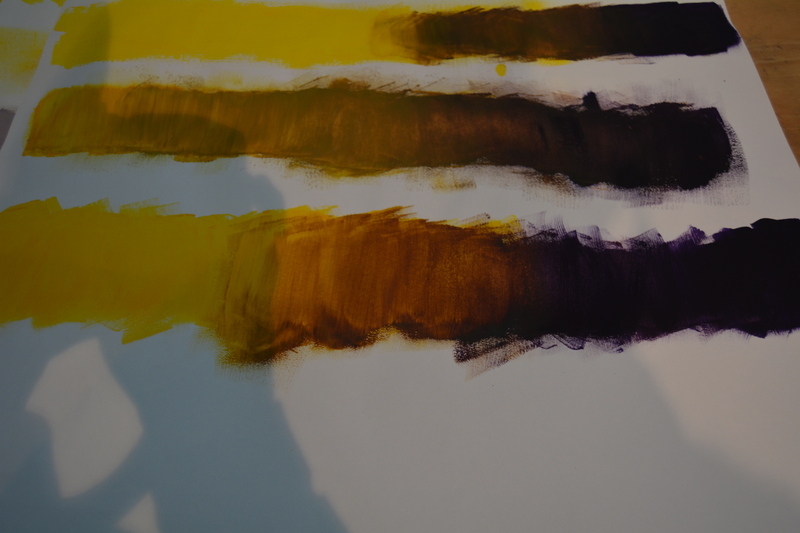 One choice I made was to practice combining complementary colors and other contrasting colors in acrylic paint to show gradual value. I found this very difficult because with paint you have to be very conscious and aware so that you don’t make mistakes, and so I redid some value scales more than once to improve my skill. I found that using pallet knives is of my strengths in acrylic paint, definitely more than using normal brushes. Something new I learned was that mixing complementary colors gives you brown. 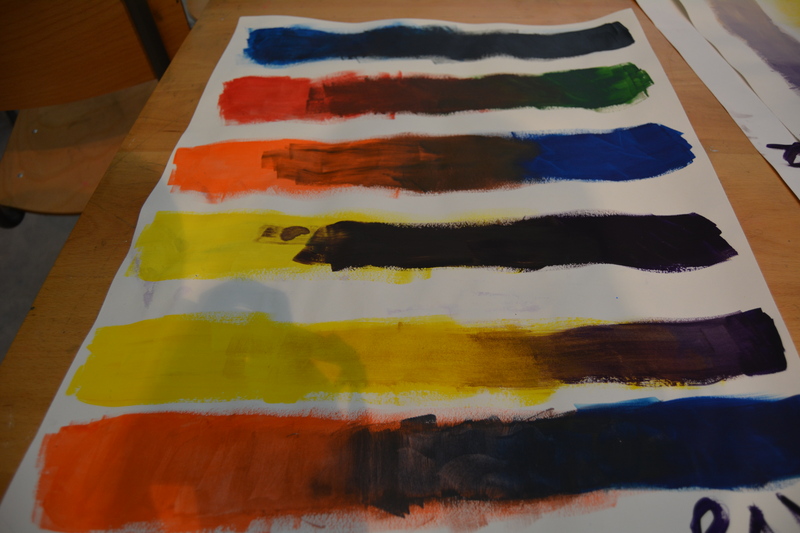 I also learnt that you have to apply the paint slowly and carefully to get a good value scale. Something I would change is to work on my value scales a lot more, I realize I’m really not the best at it, and the only way to improve is to keep doing it until you get it right. 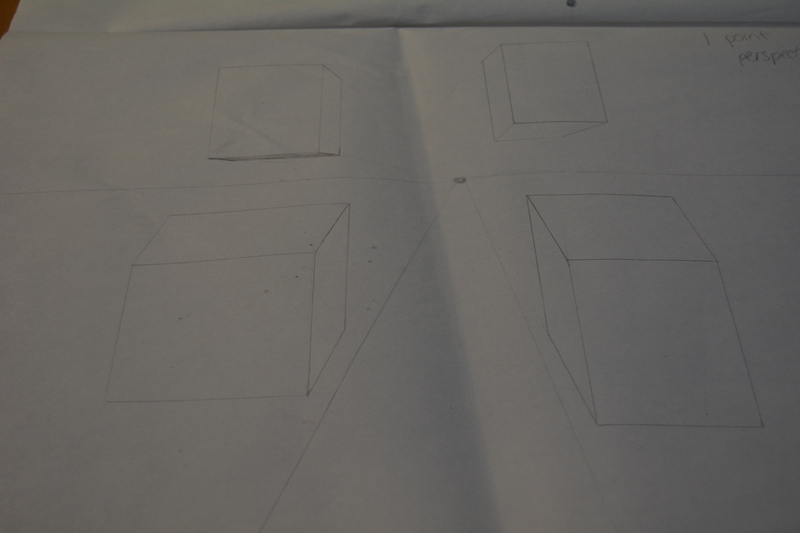 One choice I made was which geometric shapes I was going to use, and how to lay them out. For this formative, I decided to use one color except manipulating it with white, and black (if necessary), to show the value difference between the shapes. 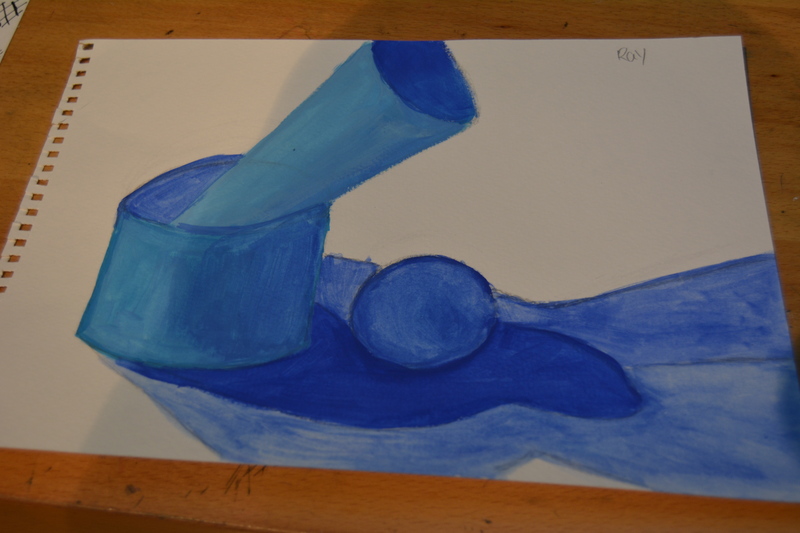 I also chose to do one color because I found that it was easier when I practised doing the value scales formative above. I feel like I did pretty well on this, I really like the contrast between light and dark, and how the shadows play a role too. Something new I learned was that you can’t just apply value to objects from your head. You have to actually find out where the dark areas are, and where the light areas are. Otherwise, it won’t look very realistic if you just make it up. Also, I learnt to make sure that the lights in the classroom were all facing the same direction so that the shadows and value don’t change. Something I would change is to draw the geometric shapes in better proportion. Even though Mr Hansen said that as long as the value was accurate, the proportion didn’t matter that much, I feel that to improve further I need to do both things to a high standard. 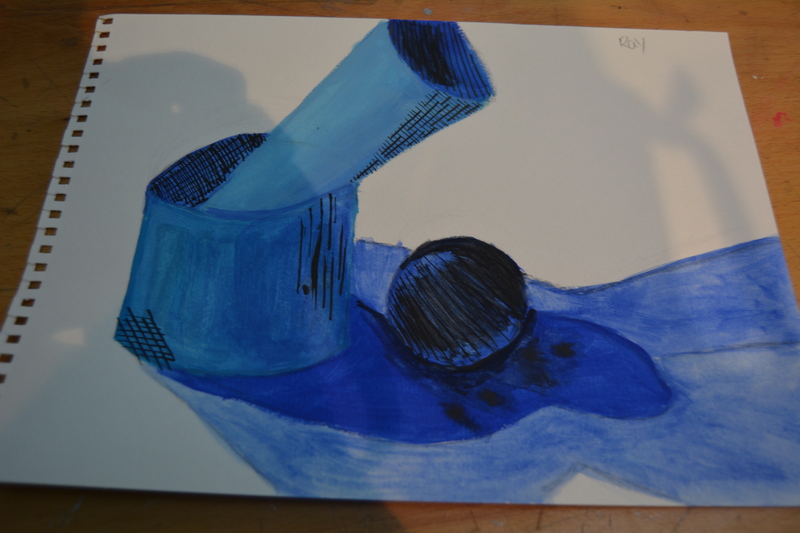 One choice I made was to use the blue as my focus color. 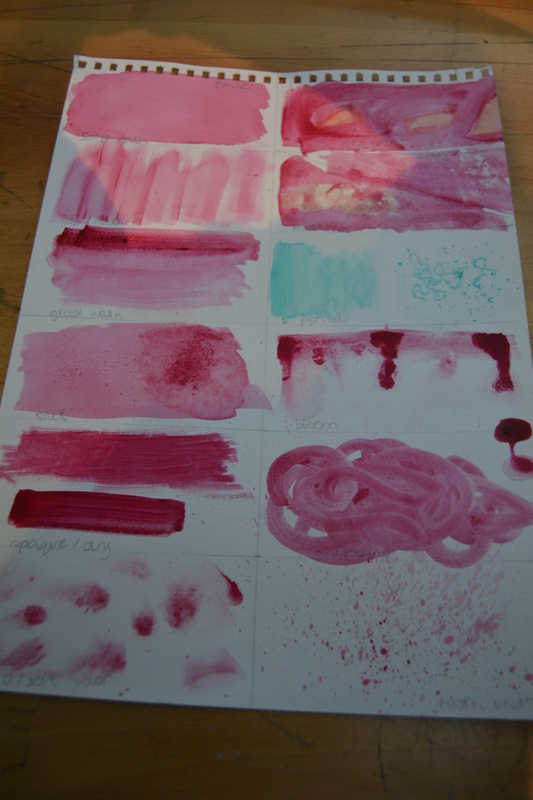 I found out that I like using water-color in package trays instead of water-color that is squeezed out of a tube. 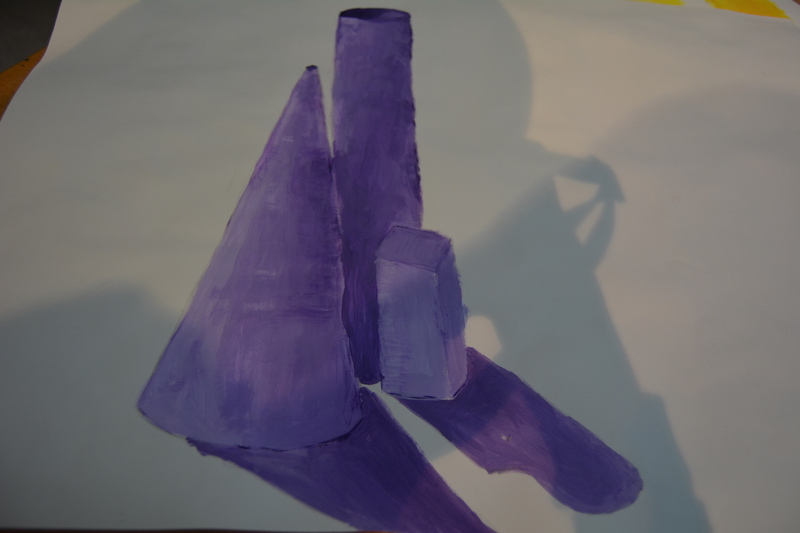 Anyways, I used the concept of value to show different in lighting and shadow between the objects. To create value, I used two different blues (dark blue and turquoise) and then mixed each with white to create the in-betweens. Smart huh? Something new I learned was that you don’t have to use more than one color to create value, you can use one color and just manipulate its lightness or darkness by adding white and black appropriately. I also learnt that if you make a mistake with water color, all you have to do is dab it with a napkin until its right off..very useful! Something I would change is have drawn the geometric forms a bit better. The cylinder looks thinner at the top than at the bottom, and I could definitely tweek the cone and the sphere a little more. Also, I realized that my proportion is inaccurate, which is another thing I would work on some more. 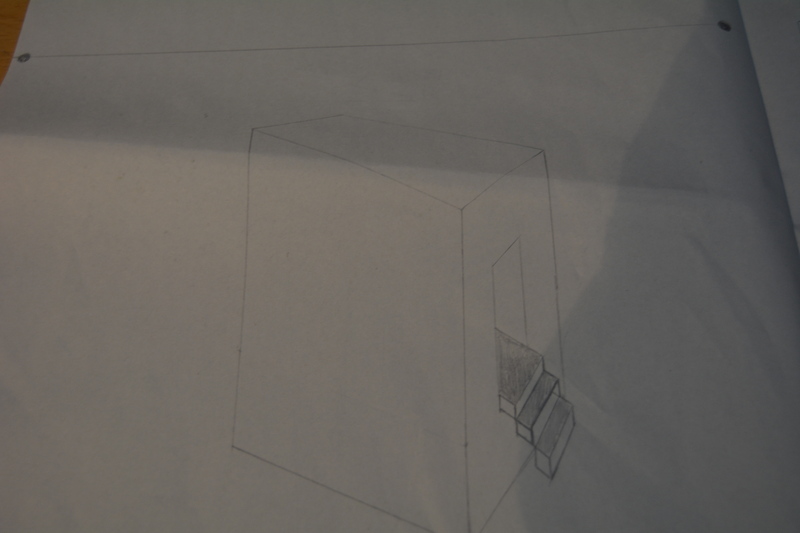 One choice I made was to make two large boxes at below the point (horizon line), and two small boxes above it. They are also almost directly opposite each other which is nice. Something new I learned was that the boxes (cubes) below the point will have visible roofs and invisible bottoms, while the the boxes above the point will have invisible roofs, and visible bottoms. Something I would change is to add more boxes in to make it trickier and more abstract ( I really enjoyed the examples Mr Hansen showed us of abstract point perspective art, it’s really cool!). One choice I made was to add stairs to the front door instead of the other sides of the house. I also decided to shade each step to make it stand out more. Something new I learned was how to make the door look so realistic. What I mean is that I never knew how to make stairs look like they’re going through the door, and now I do!! So now whoever lives in that house can actually go inside. Something I would change is to add more detail to the house to get more practice at 2 point perspective. I would also add some more houses so that it looks more like a community and not just a lone house in the middle of nowhere. 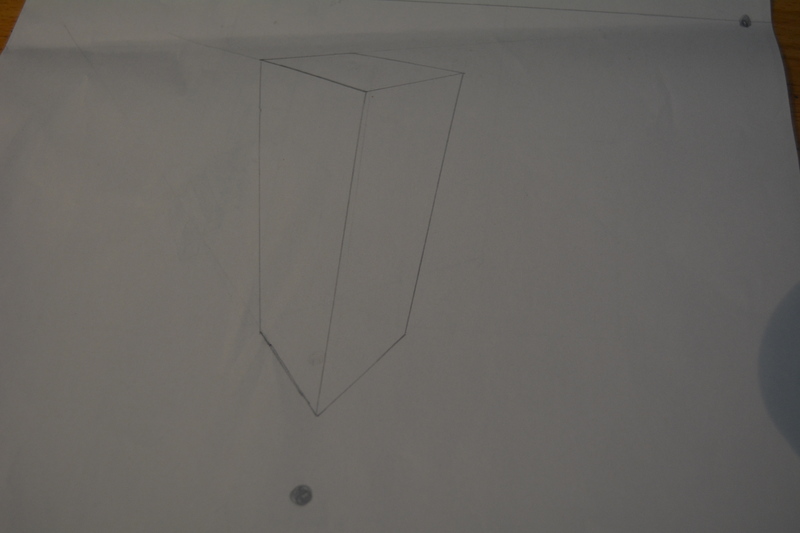 One choice I made was to practice drawing a rectangular prism both above and below and horizon line. 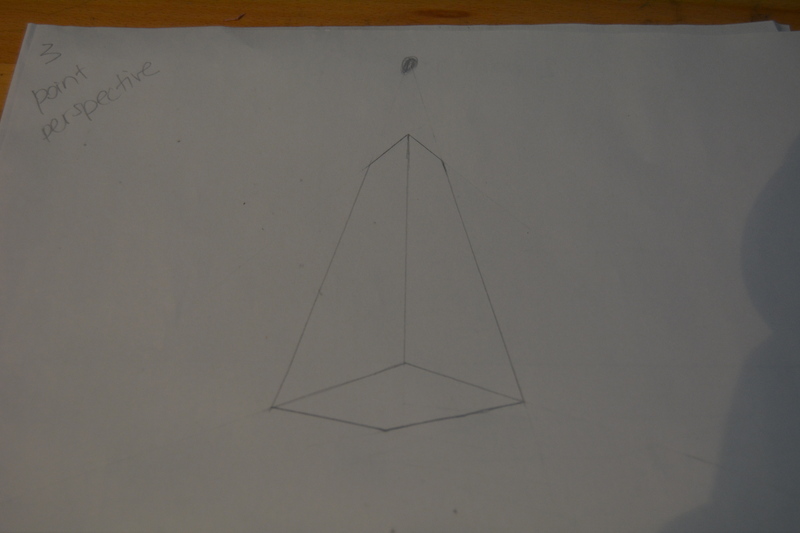 I also realised that both prisms are the same shape, except they’re symmetrically opposite each other. Something new I learned was just generally the whole concept of 3 point perspective (the only point perspective I’ve never done before). It’s amazing how each perspective is done in only slightly different ways to the others, but then they look genuinely different at the end. Something I would change is nothing except to practice this perspective a little more so that I can ace it. In fact, I should definitely try to make an abstraction from one of these perspectives, that would really show me how good/bad I am at it. 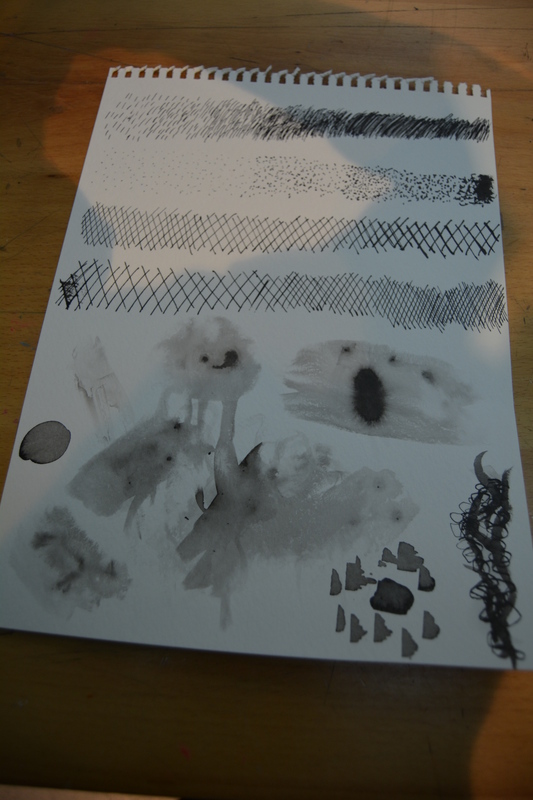 One choice I made was to practice using the quill in different ways. For example, I practiced doing hatch, then dots, then cross hatch changing value, then cross hatch changing line thickness. I also applied it over my water color geometric forms formative, and experimented with using water and ink together (top left picture). Overall, I think ink pen is not of my strongest art appliances. I find it irritating because if you make a mistake you can’t correct it, and you can easily smudge it with the lightest touch. Something new I learned was how to use the quill and how to apply the ink in different styles, while previously in dry media, we had a choice of using ink pens, not quills, for our finals. Quills are definitely quite tricky to use, they run out quickly and they don’t always satisfy you with the end result. Something I would change is to work on my trials (top right picture) more because frankly they look very messy and rushed, and it would be good to enhance my skill. Hey! Ok, so to begin, I adore your blog! Great job on the layout and presentation, it looks great! I think you were very creative with your sketches, and your value scales were really well done. Though I think you could’ve added some more water colour sketches. Hi Marya! Hahaha thank you so much, that’s so kind of you!! =) I agree, thank you for your feedback. It’s very useful and I will keep it in mind for my next art projects.